Twenty-four DNCBers (named at end) enjoyed a gorgeous, uncharacteristically sunny, Tuesday morning wandering around UBC’s Botanical Garden. The outing was organized and led by Debbi Hlady, a Delta Nat and an FOG (Friend of the Garden). We saw lots of neat birds and plants, many of them pictured on our DNCB Picasa site. Ten of us met at Petra’s and car-pooled very smoothly (Spring Break) at 8:00 a.m. to UBC. We arrived shortly before the 8:45 a.m. scheduled arrival, and registered our vehicles, as instructed, to park for free for 3 hours. The group huddled together at the entrance before moving under the Magnolia Tree for the mandatory Group Photo by West Van’s Richard H.
Debbi gave us some Introductory Remarks about the Garden before we entered through the turnstile; check out their very informative website at: http://botanicalgarden.ubc.ca/. While Debbi spoke, many distracted listeners excitedly watched two Pileated Woodpeckers on a nearby dead trunk. For the next two hours, everyone continuously commented on the gorgeous weather, the beautiful flowers and how fortunate we were to be in this paradisiacal garden today. The trail signage was very helpful and Debbi and a few other “experts” in our midst helped guide us as well as we wandered through the various different sections of the Garden. Splinter groups stopped occasionally to spot birds, but most often just to chat. Some neat sightings included Varied Thrushes, Golden-crowned Kinglets, Hutton’s Vireo, Pacific Wrens, Hummingbirds, and flowers like Shooting Stars and Fawn Lilies (the only names I remember). 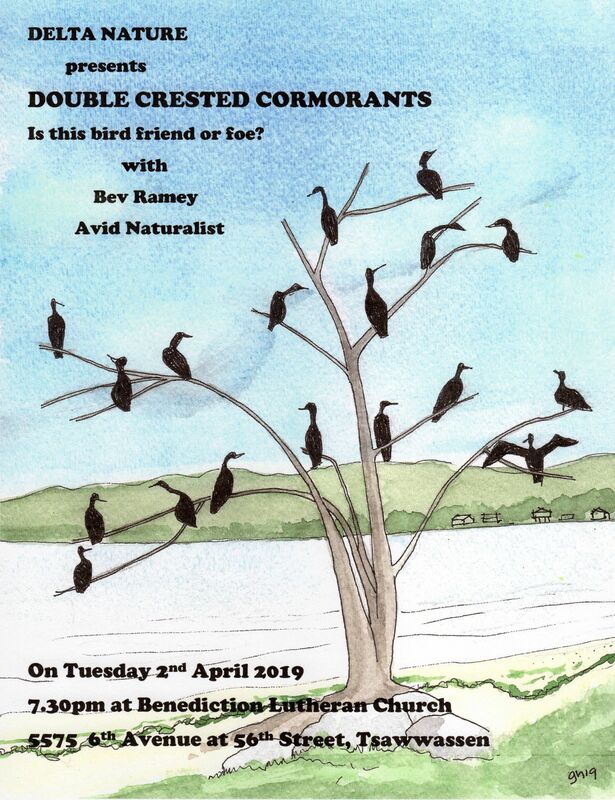 A comprehensive Bird Sightings List is at the end of this report. We wandered by (as some of us did) the suspended rope walkways and tree platforms of the Greenheart Tree Canopy suspended 80 feet above the coastal temperate rainforest floor. It would be an exhilarating way to view birds such as the Brown Creeper, sighted by one of the naturalists last summer. Following the Physics Garden (medicinal plants), I had to leave early at 11:00 a.m. for Opening Day of my golf club at Tsawwassen Springs Golf Course. Unfortunately, I missed the Beer Garden walk and the Barred Owl. Debbi and others contributed reports on the outing which I have meshed together at the end. Another awesome DNCB outing; a tonne of thanks to Debbi for organizing and leading it. Outing Participants were: Organizer Debbi Hlady, experts Bev Ramey, Mary Taitt, Al Schulze, Anne Murray, Bikers Margaretha S and Peter W, sisters Pat & Maureen, West Van’s Roy & Gordon, photogs Liz S, Glen B, Terry C, Brian A, Jim K, Richard H, Jean G & Pauline O, WRSN Liz W, Mike B, Sheila Y and me (23, I missed someone). 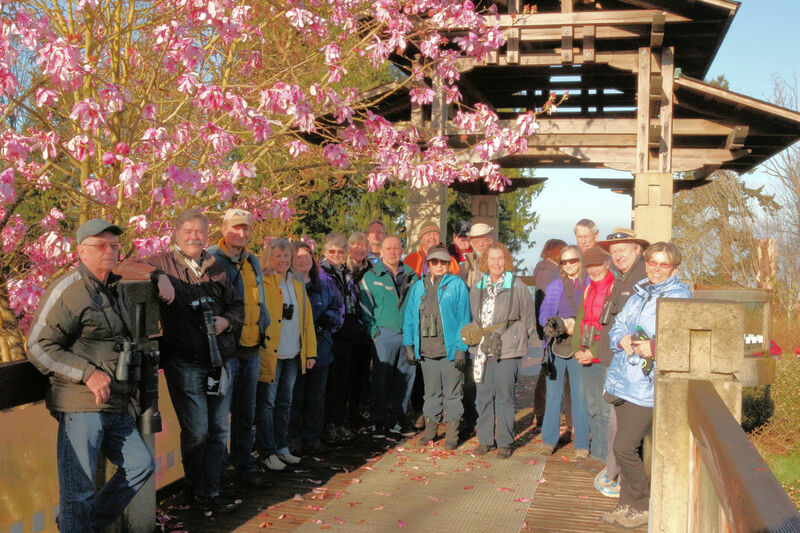 Debbi Reports: Total Species seen must total 45 – 50 species – this is great start for the UBC Botanical Garden Bird Checklist!!! 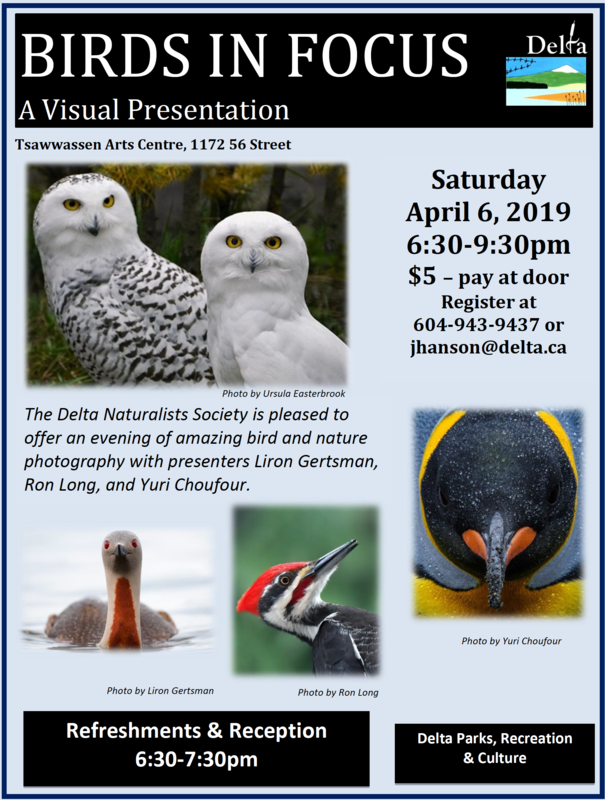 Way to go Delta Naturalists – thanks everyone! Bev also provided a copy of Vancouver Nature 2013 Greater Vancouver Checklist, and eBird info which has 84 species registered for the Garden. Glen Bodie’s CheckList with additions from Liz Stewart, Anne Murray, Mary Taitt, Bev Ramey, Al Schulze, Terry Carr, Debbi and others; total 39. We heard that there was a Yellow-rumped Warbler around (Audubon), but none of us saw it. Al Schulze saw a visiting lady’s picture on her camera. – rock outcrops simulate nature montane and alpine habitats from around the world! There is also a large ARBOUR behind the FOOD garden, displaying a variety of climbing plants: clematis, wisteria, trumpet vine and bittersweet. If anyone wants to pursue the garden anytime with me I have a permanent free guest pass ticket – let me know! 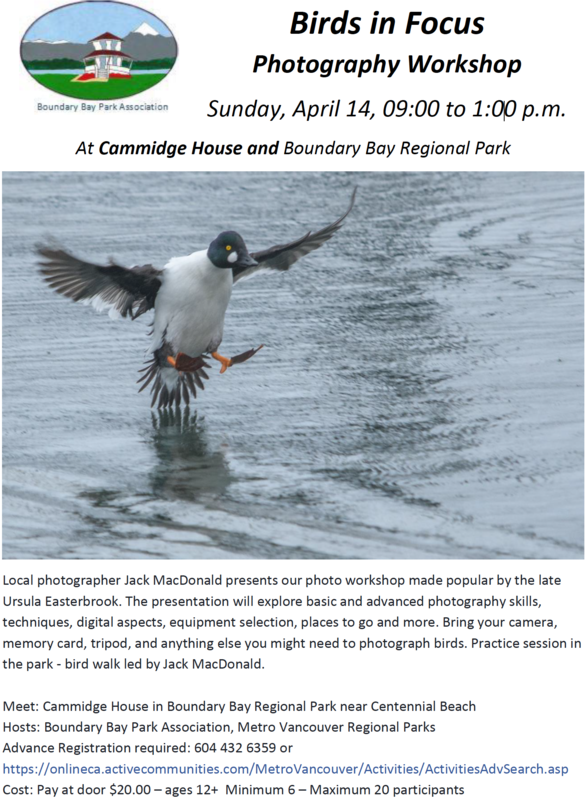 Perhaps another Delta Naturalists visit in May for migratory songbirds? We can explore this NE corner of the garden, and Pacific Spirit Park since we didn’t get a chance yesterday. I will continue to do walks Wednesday mornings 9:30-10:00am and 11:00am-12:00pm for the next 6 weeks before the Botanical Garden (& Wildlife theme this year) Plant Sale, Saturday May 7, if anyone wishes to return to the garden help spot the migrating songbirds. The UBC Friends of Garden (FOG) presentations are from 10am-11am, and anyone is welcome to attend this too. P.S. – too bad Tom left early for golf, and missed the “Beer Trail” and our sighting of the Barred Owl!!! This entry was posted in *DNCB, Bald Eagle, Barred Owl, Botanical Garden, Hutton's Vireo, Pileated Woodpecker, UBC, Yellow-rumped Warbler. Bookmark the permalink.